Patrik Lindström Electro, Futurepop System Syn's release 'Strangers' from last year is an album that still has a high popularity in my playlists. Probably one of the best releases of 2010 in my book with a never-ending line of potential hits and singles to show for. With that comes great expectations and it's easy to be disappointed and even though I am not disappointed, I somehow feel that I expected more, probably due to my unreachable expectations, since 'All Seasons Pass' is still a great album. It has a bit different sound, that kind of difference that is hard to pin point exactly in what and where it lays. Some of the tracks could fit right into the former album like "Ordinary Life" and "An Excuse Never Received" to mention a few. When I listen to them both and compare them, they are more similar in sound than how I look upon them. When compared side by side, it's probably the voice effects in "The Lesson" and "Path of Least Resistance" that strikes me as most unexpected. I still think of them as a bit different, but now when forced to put words on that thought, it's almost impossible. Perhaps I can explain it better a few months from now, when I have some distance to it. What is not different in any way is the great sound, amazing quality and the emotion and love that has gone into everything they do. Well written lyrics with highest standard of composition. I had not expected anything less from the American guys. While the hit/single potential might have dropped from the earlier 97% to perhaps 85%, it's still one hell of an album filled with great tracks, like earlier mentioned "Ordinary Life" and "An Excuse Never Received", but also the slow and heavy "Good Night" with its amazing melody, "Absence" and "Confession". 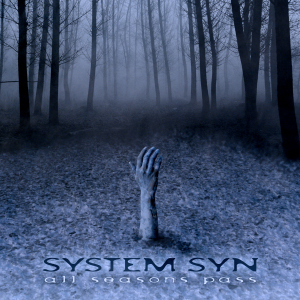 System Syn's release 'Strangers' from last year is an album that still has a high popularity in my playlists. Probably one of the best releases of 2010 in my book with a never-ending line of potential hits and singles to show for. With that comes great expectations and it's easy to be disappointed and even though I am not disappointed, I somehow feel that I expected more, probably due to my unreachable expectations, since 'All Seasons Pass' is still a great album. By the act of giving out two great albums with only a year between them, it simply shows how much quality, creativity and energy System Syn possesses. Amazing is the only word good enough.